The Seat: This configuration of a Delta Airlines 757 is where I first realized the benefits of a good exit row seat back when it was a TWA aircraft. I was not sitting in this seat at that time. 36F is a bit confining and could prove to be painfully uncomfortable if you’re next to (or are) a “passenger of size“. In this case I lucked out with an empty middle seat…a rare occurrence. Seat width is eaten up by having both your personal video screen and tray table in the armrest. In addition to all this, you’re stuck behind the dreaded exit door slide, partially boxing you in from the front. 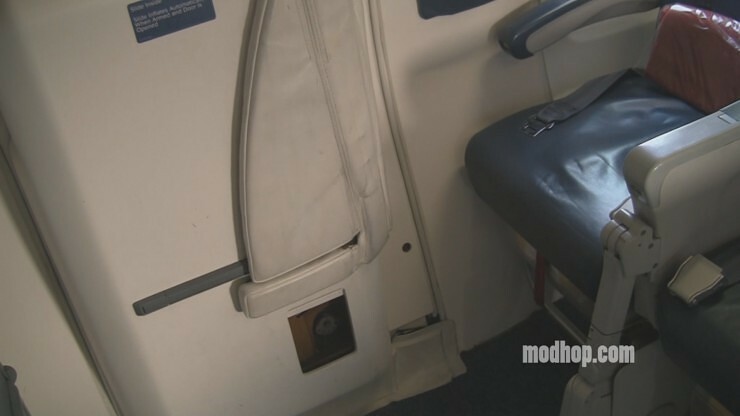 While not as bad as other confining exit doors, it can still be uncomfortable having to angle your legs to stretch them out on longer flights. Service: Delta keeps their transcon (New York/Boston – Los Angeles/San Francisco) service competitive by offering in-flight wi-fi, personal video units and an enhanced EATS menu. Stacks up nicely against other legacy carriers (American, United) in economy but lacks some of the extras found aboard newer airlines (Jet Blue, Virgin America). Flight attendants were cordial but seemed to be a bit rushed throughout the flight. Notes: This economy section is split just before this row by a pair of lavatories. There are fewer seats in the rear section of this cabin giving it a more exclusive feel and could even be a bit quieter than up front. Summary: This seat and it’s cross-aisle equivalent (34A) aren’t the best choices but certainly tolerable if don’t mind slightly angling your legs for a few hours. The most glaring advantage might be that you’re able to stand up without bothering your neighbors. Rating: 2.0 hops (of 5). Strategy: Only Delta Medallion (elite) passengers can reserve these seats in advance but you can request them at the airport. Get to the gate early for your best chance. Being first in line helps if you’re requesting otherwise unavailable exit or bulkhead seats.